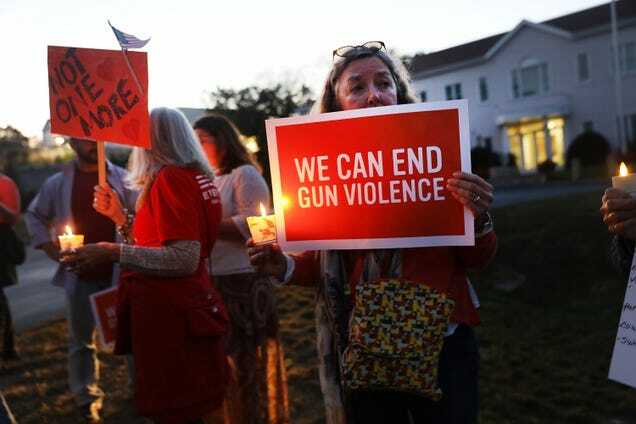 Dozens of people attend a vigil remembering the 59 people killed in shooting in Las Vegas and calling for action against guns on Oct. 4, 2017, in Newtown, Conn.
Delta Airlines is one of the biggest employers in the state of Georgia. It has a hub at Atlanta’s Hartsfield-Jackson International Airport. You’d think that state legislators would want to protect and nurture that relationship, but you’d be wrong. Delta was one of many companies to end their business relationship with the National Rifle Association in the wake of the Feb. 14 Parkland, Fla., school shooting that left 17 people dead. The New York Times reports that in response to that decision, Georgia lawmakers approved a bill Thursday that took away a proposed tax break for the airline. It’s clear that Cagle was looking to kiss the collective asses of the NRA and its supporters. His threat came on the heels of Delta’s announcement that it would no longer provide a promotional discount to members of the NRA. Delta was seeking a $50 million sales tax exemption on jet fuel. The exemption had previously been included in a broader tax-relief bill, but the version of the bill that went before the Georgia Senate on Thursday did not include the jet-fuel tax break. The Georgia House had already approved a version that included the tax break, but it readily approved the new version that excluded it. In case it needs mentioning, both houses of the Georgia Legislature are controlled by Republicans. Georgia Gov. Nathan Deal has pledged to sign the bill into law even though he is a supporter of the jet-fuel tax break. According to the Times, he said he would only sign the bill because it also includes a significant reduction in personal and corporate tax rates. So Georgia is putting guns before people. Got it. When is the meteor striking us again?